More than 200 workers and 40 Central Oregon companies worked on site. The next 50 years: all of the MEC buildings are designed for easy expansion to the South. The electrical, plumbing, and communication utilities are ready to go! First LEED® Certified building in Central Oregon and first LEED® Certified Electric Cooperative in USA and World! The 13-inch Insulated Concrete Form (ICF) Walls of the Administration Building envelope are constructed with recycled foam and fly ash concrete. The overall wall insulation value of R-42 reduces noise pollution from the outdoors and increases energy efficiency and comfort. The large high performance windows have an aluminum frame with a break and are constructed with a double pane, low emissivity (low-e), argon filled, clear glass. They provide an overall high insulation value of the envelope, which allows the maximum amount of natural daylight into the interior spaces of the Administration Building. The fluorescent light fixtures are equipped with a high performance T8 lighting system. The light fixtures that are placed close to the large windows will dim or turn off when there is an ample amount of natural daylight available in the interior spaces. There are the two deep-water wells that provide water to our water source heat pump system for heating and cooling of the Administration and Dispatch buildings. Water is drawn from one well and re-injected into the second well. Heat is exchanged from the water to the inside loop and vise versa. The Administration Building is saving 40-50% on its heating and cooling bill! 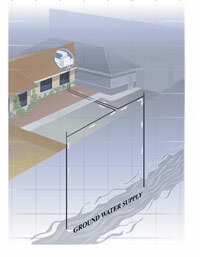 The geothermal heat pump draws heat out of the ground water and transfers it into the building. Because the ground water stays a constant temperature, the geothermal heat pump is super-efficient. The EMS system allows an individual to change setpoints or view that status of an area or system through their own computer. The solar PV array that is 40-175W panels that equals 7 kW of DC power. The DC power is converted to AC power and is estimated to generate 10,000 kWhs a year, or 12% of the estimated annual energy use of the Administration building. The other 88% of the total annual energy use is generated by 100% wind power. MEC offers green power to our members. MEC provides an educational interactive kiosk and tour that highlights the LEED features of the Administration Building, solar data form the solar PV system, and general coop information. It will be expanded on as needed. The modular wall and floor system allows for flexibility of the interior of the Administration Building. The system provides the ability to reconfigure any office or meeting space of the interior without demolition of old walls and construction of new walls. Native plants and grass make up the natural landscape of the MEC site. These plants require little or no water and reduce the dependency on local water resources by 50%. A 100% on-site storm water system is designed to limit the disruption of natural water flows by eliminating storm water run-off and contaminants. All of the outdoor light fixtures are designed so that there is no up light present in the sky and that there is no light that spills off the property. This increases night sky visibility and does not intrude into nocturnal habitats. There are designated parking spaces equipped with electric car plug-ins in the parking lot of the Administration Building. These spaces promote the use of electric cars that reduce pollution compared to traditional automobiles. LEED requires that we provide changing rooms and shower facilities to Midstate employees, along with bicycle parking. An exercise room is also provided as part of the employee wellness program. Local Central Oregon firms provided most of the materials and services used in construction of the Administration Building. By using these products and services, MEC has positively influenced the local economy. Most of the wood products used in the construction of the Administration building contained the Forest Stewardship Council (FSC) Certification. The FSC follows the “chain of custody” of wood products to verify that they are not manufactured with endangered or old growth trees. All of the materials in the Administration Building contain no or low Volatile Organic Compounds (VOC). LEED requires that materials like carpet, cabinets, paint and other adhesives have a low VOC content. This creates a healthy environment for the employees and the members of MEC that visit our building. Fresh air is vented into the Administration Building to supply more ventilation to the building occupants. Because we are adding more outside air into the building, conditioned air must be exhausted. The heat in this exhausted air is captured through an air-to-air “heat exchanger” and transferred into the fresh air stream. Typically, 60-70% of the heat can be transferred. The large windows allow 75% of the regularly occupied areas to have a view of the outdoors and 90% of those spaces receive natural daylight. Studies show that these features improve employee productivity. Thank you to all of the design team, consultants, contractors, and sub-contractors for their efforts towards LEED Gold Certification! For more information on green building and energy efficiency rebates or assisistance, contact us at (541) 536-2126 option 5 or (800) 722-7219 option 5, email marketing@midstateelectric.coop. TOURS ARE ALSO AVAILABLE. CALL FOR AN APPOINTMENT!